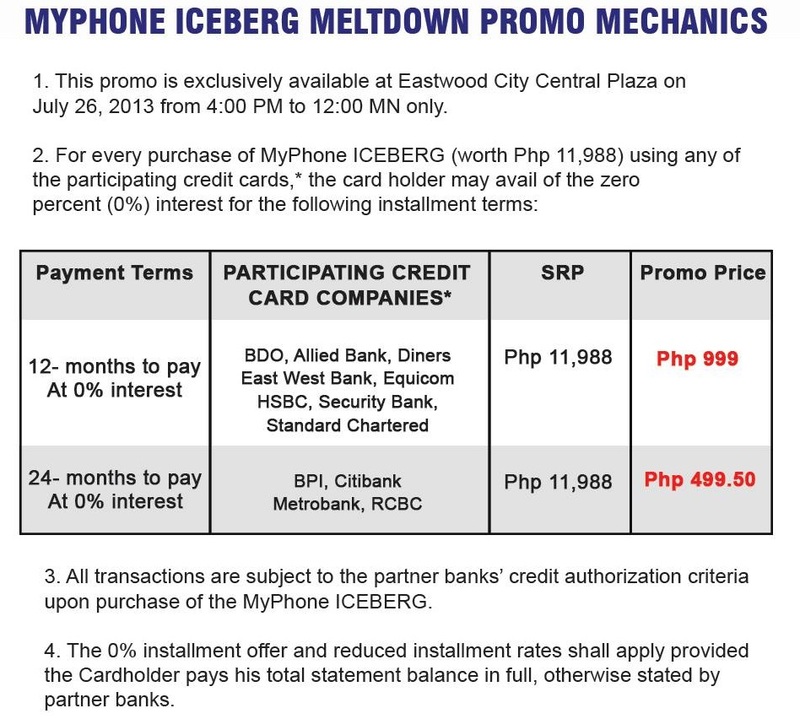 I know it's rainy season, and Myphone is making it more cold by releasing its Myphone Iceberg, this coming July 26 at Eastwood City Center Plaza, before it'll be releasing nationwide. But of course, we don't have any clue when it is, as for now. Myphone Iceberg has an amazing exclusive features and specs and it is rumored that this phone worth Php11,990 (Not the official price). 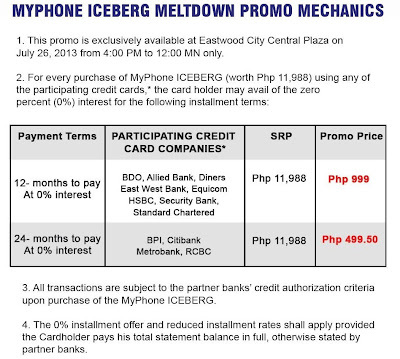 Myphone Iceberg has 2 years warranty, only if you first buy it at Eastwood City, after that, the warranty will be back to its original 1 year. One of the amazing feature of Myphone Iceberg is the Sony sensor in the camera with a picture quality of 12MP with flash. Aside from that, Myphone Iceberg was been built with scratch resistant corning gorilla glass 2, huge 5.7inch IPS display, and the freezing sleek and thin aluminum body, no more cheap plastic that click and clacks when you press it. And guess what... no more Philippines map on the back cover of the phone, as some of the other users doesn't like it. But, let's also understand that Myphone is branded in the Philippines, so they're probably proud and let the whole world know that MyPhone is proudly made in our country. More Myphone Iceberg Specification below. Aluminum Body - Yup, the first among the rest. With the full integration of Aluminum body, Myphone Iceberg will not just be durable but also cool and sleek looking. Clever Motion Feature - More like O+ air shuffle or Samsung' smart gesture that lets you control your phone using sensors like waving your hand to capture images, wave to dim, flip to mute, and clever dial. Wireless HDMI - I'm not quite sure how it works, but according to Myphone the wireless display accessory will be sold separately, and by the way wireless display means showing your phone display on TV or LCD TV. Anti-Theft Technology - A pinoy technology built for Myphone also known as Theft Apprehension and Asset Recovery Application or TARA, using these technology you can freely control your smartphone whatever case may happens. Corning Gorilla Glass 2 - An upgraded version of Gorilla Glass, which basically means more scratch endurance. Jelly Bean 4.2 - The latest is always the best, higher version means more compatibility and that's the best way we can have the most of Myphone Agua Iceberg. 16GB Internal Memory - I don't think you'll ever gonna need a microSD, but if 16GB is not enough for you then just use an SDcard . Available at Eastwood City Center Plaza on June 26, 2013. Also available at Php499.50 per month at participating banks such as Citibank, Metrobank, RCBC, BPI with 2 years warranty. Myphone is having a giveaway promo on its beloved MyPhone Iceberg. Its really simple to join, and believe me it won't take a sweat. 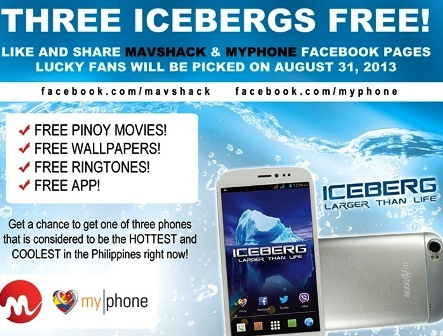 Myphone will select three winners of Custom Myphone Iceberg, winners will be announced on August 31,2013. How to join on Myphone ICEBERG Promo? "Mavshack is the best Video on Demand service for PINOY Movies and MyPhone is the number one mobile brand in the Philippines, LIKE AND SHARE na friends!" Email the screen shot of the recently shared image to lozatechops@gmail.com with your FULL NAME, ADDRESS, FACEBOOK ACCOUNT and MOBILE NUMBER. Thats it! and Good Luck! 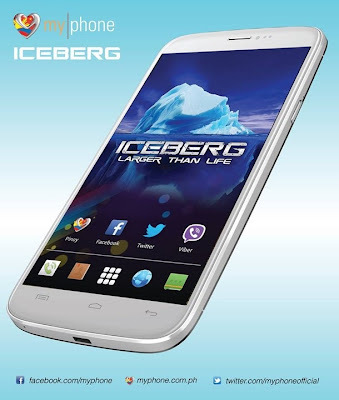 Myphone Iceberg is also called Myphone Agua Iceberg and also called BLU Life View. So, what can you say about BLU Life View? 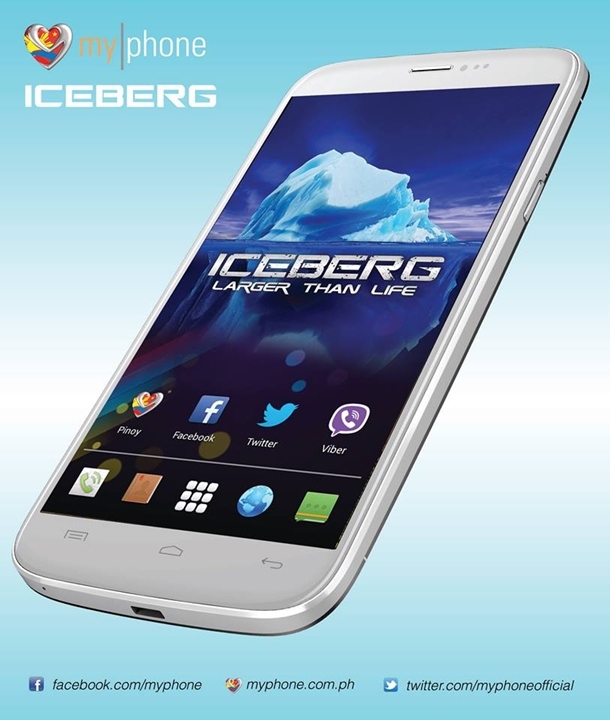 Rather Myphone Agua Iceberg, I mean... Myphone Iceberg...hehehe, kindly share your thoughts about this phone with us! I am planning to get the A919i Duo. But since I read your blog, I am convinced to get this model. I would also like to know if this is for sale on the given date of July 24 in Eastwood. Much appreciated if you answer my questions. Thanks! Its July 26 my friend at Eastwood. Take that opportunity as Myphone will give you 2 years warranty at the given moment. oooopssss... A919i REALY GOOD TO ME!!! BUT THAT PHONE (ICEBERG named) realy niced specs atract me!!! 5.7 HD SCREEN DISPLAY? QUADCORE? GORILLA GLAZ? AND much good batterylyf? OWSOME!!!!! ILL WAIT FOR MY PHONE (ICEBERG) to release! We need more time to clarify that matter, sa ngayon antay antay lang muna ng release. As far as I know meron eh, tsaka wala namang rason na hindi nila ilagay. I do patronize Pinoy Products (BUY PINOY)... And specs of MyPhone Iceberg really attract me idol, however, the specs were silent as to expandable memory??? Additionally, i would like to ask what does this feature means "microUSB (USB-OTG) / 3.5mm audio jack"... Thanks a lot!! confirmed na po na walang microSD support..about naman sa USB-OTG ito ay: specification that allows USB devices such as digital audio players or mobile phones to act as a host, allowing other USB devices like a USB flash drive, mouse, or keyboard to be attached to them. In other words, parang PC na pweding mag insert ng USB device. about naman sa 3.5mm audio jack, ito yung sukat ng jack or PIN ng headset na kakasya dun sa device. 3.5mm standard na sukat yun. I hope I answered your questions. Can I read some of your article Mr. Anonymous? Unless you have the guts to show who YOU are, then maybe I can take some of your advice, but as of now I will just label you as an HATER! Or are you just jealous your blog post didn't rank on Google? Crab Mentality really s.u.c.k.s! as long as naiintindihan naman yung ibig sabihin at pinararating na mensahe, i think walang masama. i think his english is much better than the others, based on my opinion (sa mga nabasa ko na rin). so chill mga dude, there's no reason para manlait tayo ng kapwa natin pinoy. I think he's doing his best, so that the other country can also understand, kung anu man ang about sa post na ito. Can I read some of your article Mr. Anonymous? Unless you have the guts to show who YOU are, then maybe I can take some of your advice, but as of now I will just label you as (an)a HATER! Or are you just jealous your blog post didn't rank on Google? Crab Mentality really s.u.c.k.s! Stop considering a single speck of Dust in your 100 inch TV. Well, to the Anonymous Person above. It is insane to told people to stop and give up his hobby or passion just because of some English grammar mistake. I think his doing his best. Well, i guess you're using your amazing English Expertise in making your own money. you're sick dude! To all Admins, don't lose hope, in time, you'll be great. I think you're just a beginner in this field, so keep it up and learn more. What if my credit card is American Express? Is it still qualified? I hope it is. Not sure about that, but American Express is widely accepted. You should give it a try. Yo bro, is it really true that this unit is available for an external drive (microSD)? I've been reading some of reviews and some say there's no external storage. I need your advice bro. I'm planning to get A919i Duo also, pero nung lumabas na ung Iceberg, mukhang gusto ko na din kunin un. Hindi naman ako masyado mahilig sa games, although kahit mga 5-7 games ok na ako dun. I don't usually put movies sa phone ko, pero short videos pwede pa. Music naman i still have my 80 gig ipod. I just want a smart phone that is sharp. Gusto ko kasi gamitin for work. What do you think bro? Iceberg or A919i Duo? Hassle lang din kasi ung size ng Iceberg eh. Thanks for your time bro. Thanks! Go for CM Razor, stylish at may class siya at mukhang mamahalin. O+ 8.15 is also cool, and made in USA. @julz hindi gawang amerika ang 0+ :) try to research it first before ka magsabi ng info. @anonymous Designed in US yan, pero made in Asia. Just to clarify, san ba gawa ang iPhone? diba sa China, pero tawag natin sa iPhone made in California. This phone got my attention. Great write-up, very informative. Please update us whether it has a micro sim card (expandable to 32?) or not. This is the only option that makes me hesitate to get one. sir kailan ba mgkaroon nang Iceberg dito sa visayas? Sabay sabay naman yan after release. Basta't merong Mtphone Kiosk sa inyo magiging available yan. how true that the battery of Iceberg is non-removable. sayang lang kung ganito, pagnasira yung battery wala na rin silbi ang phone. sana pag nareleased to ..
kasabay na rin sana neto ung ANDROID 5.0, and i hope,upgradable din siya to the latest androidOS. Am proud to be a Pinoy, I want to thank you all who make positive comment here let us promote our very own product for us to skyrockted in the smartphone technology to help and encourage our local manufacturer and producer to conitnue in doing their very best to produce quality and affordable that soon to conquer the world i am sure we can do it by God's super abounding grace. We do also have magagaling na engineers who are just being used by other neighboring counties, we can encourage them also to go back here para lalong umunlad and ating bansa, so lets work hand and hand brothers. . .buy Pinoy brand I like "MyPhone Iceberg" when that would be available in the market because I want to replace my HTC? Available na po sa Myphone stores. Quad-Core MediaTek MT6859 @ 1.2GHz CPU. PowerVR Series 5XT GPU. 144 x 73 x 8.9 mm dimensions and 145g weight. 16GB internal memory, expandable up to 32GB. 13MP rear camera and 5MP front camera. Android 4.2 Jelly Bean out-of-box. WiFi, Bluetooth 4.0 and GPS support. Salamat sa tip, gawan natin ng post yan pag lumabas na. kelan kaya labas ng blu life n yan? sa U.S at India ay nilabas na yan, tatlo kc cla na unit magkasabay kinumpit sa cherry cosmos series, pro hndi sinabay ng myphone ang paglabas dito sa pinas.. balak unti untiin ng myphone.. sa susunod na buwan ay meron na yan. Sir, ung gorilla glass, is scratch free, ryt? So, bka isang bagsak lng bka basag agad? I'm planning to buy iceberg sna eehhh. Ska totoo bang di removable batt.ng iceberg? Dependi narin po sa ginagamit na sharp object ang pagiging scratch free ng phone, pero matibay po yang Corning Glass 2 sa blunt force.